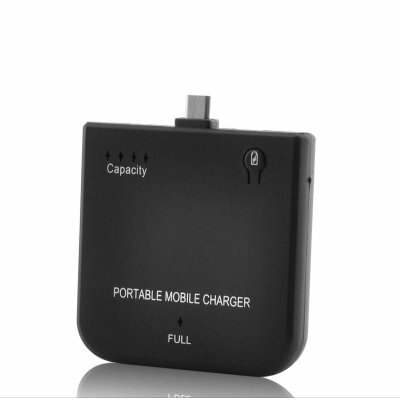 Successfully Added 1900mAh Portable Battery Charger for Mobile Phones - micro USB Connection to your Shopping Cart. 1900mAh Portable Battery Charger - emergency power supply for your mobile phones in a palm-sized black case that you can take with you anywhere. This portable battery charger is compatible with popular Samsung, HTC smartphones, and any phones which have a 5-pin micro USB port. With its 1900mAh battery, you'll get many more hours of extended usage from your smartphone to finish that one million dollar phone call with your client, or the last level of the game. The small and portable frame of this Portable Battery Charger allows it to be easily carried with you as the perfect emergency power source. It is also the ideal tech gadget for business trips, long distance rides, and other times where you are often without a power source. This portable battery charger is perfect for both personal use and resale. Available in our warehouse now, order today and we'll ship it out tomorrow. Brought to you by the leader in wholesale electronics and tech gadgets - Chinavasion. I have ordered two of them but it's just annoying that one mobile charger is not working. on 2012-03-20 11:27:08 Nice product !!! Definitely a very nice product.. I have been looking around for a additional power source for my mobile while traveling. This is absolutely fine with 1900 mAh battery - Its perfect... I loved it... Fits in any mini USB port for charging..